When an atom splits into two parts, either through natural decay or when instigated within a lab, it releases energy. This process is known as fission. It has great potential as a source of power, but is also has a number of safety, environmental, and political concerns attached to it that can hinder its use. An atom contains protons and neutrons in its central nucleus. 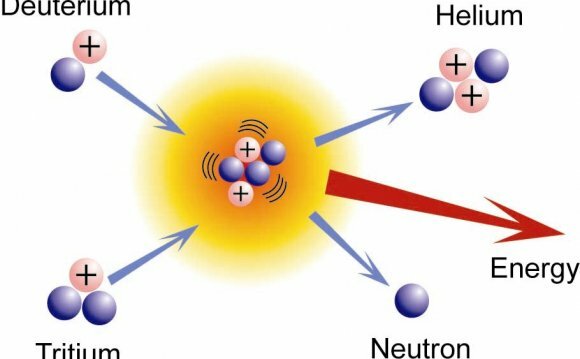 In fission, the nucleus splits, either through radioactive decay or because it has been bombarded by other subatomic particles known as neutrinos. The resulting pieces have less combined mass than the original nucleus, with the missing mass converted into nuclear energy. Controlled fission occurs when a neutrino bombards the nucleus of an atom, breaking it into two smaller, similarly-sized nuclei. Each newly freed neutron can go on to cause two separate reactions, each of which can cause at least two more. A single impact can jumpstart a chain reaction, driving the release of still more energy. Controlled fission occurs when a very light neutrino bombards the nucleus of an atom, breaking it into two smaller, similarly-sized nuclei. The destruction releases a significant amount of energy — as much as 200 times that of the neutron that started the procedure — as well as releasing at least two more neutrinos. Controlled reactions of this sort are used to release energy within nuclear power plants. Uncontrolled reactions can fuel nuclear weapons. Radioactive fission, where the center of a heavy element spontaneously emits a charged particle as it breaks down into a smaller nucleus, does not occur often, and happens only with the heavier elements. Fission is different from the process of fusion, when two nuclei join together rather than split apart. In 1938, German physicists Otto Hahn and Fritz Strassman bombarded a uranium atom with neutrons in an attempt to make heavy elements. In a surprising twist, they wound up splitting the atom into the elements of barium and krypton, both significantly smaller than the uranium that the pair started out with. Previous efforts by physicists had resulted in only very small slivers being cut off of an atom, so the pair was puzzled by the unexpected results. Austrian-born physicist Lise Meitner, who had fled to Sweden following Hitler's invasion of her country, realized that the split had also released energy. Working on the problem, she established that fission yielded a minimum of two neutrons for each neutron that sparked a collision. 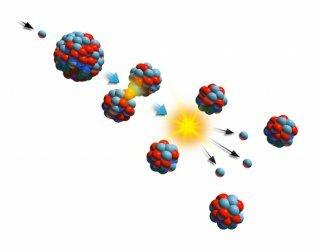 Ultimately, other physicists realized that each newly freed neutron could go on to cause two separate reactions, each of which could cause at least two more. A single impact could jumpstart a chain reaction, driving the release of still more energy. In an intellectual chain reaction, scientists began to realize the possibilities incumbent in the new discovery. A letter to U.S. President Franklin Roosevelt at the start of World War II, drafted by Hungarian physicist Leo Szilard and signed by Albert Einstein, noted that such research could be used to create a bomb of epic proportions, and addressed the idea that the Germans could feasibly deliver such a weapon to the American doorstep. Roosevelt allocated money toward American research, and in 1941, the Office of Scientific Research and Development was formed with the aim of applying the research toward national defense. In 1943, the Army Corp of Engineers took over the research for making a nuclear weapon. Known as the "Manhattan Project, " the top-secret endeavor resulted in the formation of the first atomic bomb in July 1945. Two subsequent atomic weapons were used as part of a military strike on the cities of Hiroshima and Nagasaki in Japan. Since then, nuclear research has been considered extremely sensitive. The knowledge itself is not overly complex, but the materials that fund the process are significantly more difficult to obtain. More commonly, fission is used to generate energy within a nuclear power plant. However, the process creates a significant amount of nuclear waste that can be hazardous to both people and the environment. At the same time, people often fear the dangers that could come with nuclear plants and do not want them in their area. Such issues mean that nuclear energy is not as popular as more conventional methods of obtaining energy, such as the use of fossil fuels. 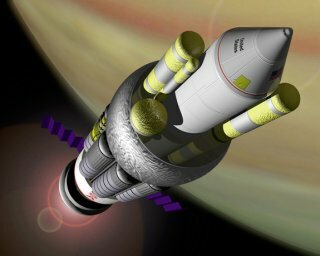 In the 1960s, U.S. government laboratories, under Project Orion, investigated a pulsed nuclear fission propulsion system. Small nuclear pulse units would be sequentially discharged from the aft end of the vehicle. A blast shield and shock absorber system would protect the crew and convert the shock loads into a continuous propulsive force. In the 1960s, the U.S. government explored the possibility of using fission as a method of rocket propulsion. However, the signing of the Limited (Nuclear) Test Ban Treaty in 1963 put an end to the aboveground explosion of all nuclear weapons, closing the door at least temporarily on the testing of fission-powered rockets. Nola Taylor Redd is a contributing writer for Live Science and Space.com. She combines her degrees in English and Astrophysics to write about science, with an emphasis on all things space-related.